notification of 09 Advance Attendant Operator Posts vacancies on direct recruitment basis. Interested and energetic applicants can apply online through Hindustan Newsprint Limited(HNL) official website. 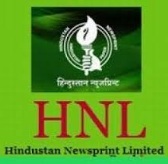 Other Hindustan Newsprint Limited(HNL) Recruitment details like age limit, qualification, Eligibility & salary, and application procedure are given below. Age Limitation: Minimum Age limit for Hindustan Newsprint Limited(HNL) Recruitment is 18 Years, Maximum Age limit for Hindustan Newsprint Limited(HNL) Recruitment is 25 Years. Age Relaxation in Upper Age limit will be given as per Indian Govt Rules. Eligibility Criteria & Qualification: Applicants minimum qualification should be B.Sc with Physics & Chemistry as compulsory and Mathematics as desirable subjects from a recognized Institute/ Boards or equivalent qualification are eligible for Hindustan Newsprint Limited(HNL) Recruitment 2018. Selected applicants in Hindustan Newsprint Limited(HNL) sector as a 09 Advance Attendant Operator Posts will get of Rs. 62501/- per month. The Hindustan Newsprint Limited(HNL) additional pay details like Grad pay and others salary details are clearly mentioned in Hindustan Newsprint Limited(HNL) official website.